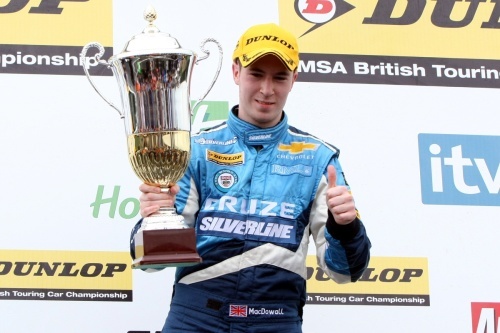 Dunlop MSA British Touring Car Championship ace Alex MacDowall will return to the UK’s premier motor racing category for a second season this year after today, Tuesday, 8th March, signing a deal to remain with Wellingborough based RML as team-mate to reigning BTCC Champion Jason Plato. The Carlisle 20-year-old, who shone extremely brightly during his maiden season in touring cars last year, will enjoy the terrific continuity of remaining with the manufacturer-supported squad as he strives to secure his maiden BTCC race win and put together a sustained challenge. Graduating to the UK’s biggest championship at the start of the 2010 season, following a successful three year tenure in the ELF Renault Clio Cup support category, fearless Alex leapt right in at the deep end to seize the opportunity with Ray Mallock’s renowned squad – and he certainly delivered. Securing two podiums in his debut campaign, he also made history at Snetterton by becoming the youngest ever driver to qualify on pole position in the BTCC – aged just 19 years and 197 days. Two events later, at Knockhill in Scotland, the Cumbrian racer made headlines again by taking his second pole position after breaking the circuit qualifying lap record. For 2011, Alex has his sights set on a top six championship push at least and has every confidence he should be able to fight for wins at the wheel of his Chevrolet Cruze – especially with a full year of touring car knowledge now under his belt. Even before Alex has turned a wheel in 2011, the year has started off well. Already a British Racing Drivers’ Club ‘Rising Star’, he was recently invited by the BRDC to be one of just 14 drivers on its prestigious ‘SuperStars’ programme – an initiative headed by ITV touring car pundit Tim Harvey. Last month, Alex enjoyed his first experience as a BRDC Superstar when he took part in a reaction time simulator test at RAF Cranwell in Lincolnshire – home of world renowned aerobatic display team The Red Arrows. In addition, for his 2010 exploits in the BTCC he was voted the championship’s ‘Best Rookie’ by visitors to the www.touringcartimes.com website. Accruing over 50 per cent of the vote, Alex was by far the most popular choice. The Silverline Chevrolet/RML partnership was named ‘Best Manufacturer’ with 48 per cent and Silverline Chevrolet was also voted ‘Best Team’. The opening three rounds of the 2011 BTCC will take place on 2nd/3rd April at Brands Hatch in Kent. Kicking-off a six month tour of the UK, the series will conclude at Silverstone National Circuit in Northamptonshire in mid-October. Before then, Alex’s first official appearance of the year with RML will come at the annual BTCC Media Day on Thursday, 24th March, at Silverstone.